We see clouds almost daily. They can grow very tall or appear flat as a pancake. They are typically white in color but also appear in different shades of grey or in brilliant yellow, orange or red. They can weigh tens of millions of tons yet float in the atmosphere. Cumulonimbus cloud seen from 38,000 feet. Clouds can be harbingers of good weather or bad. Their absence can be a good thing after a flooding rain or a bad thing during a drought. They provide relief from the heat of direct sunlight but also act as a blanket to warm the earth. Clouds help water the earth by providing precipitation but can hinder driving by reducing visibility. They come in infinite shapes and sizes yet we often recognize more familiar objects or animals. Clouds can be carried along by winds of up to 150 mph (240 km/h) or can remain stationary while the wind passes through them. They can form behind high flying aircraft or can dissipate as a plane flies through them. They are not confined to earth but are found on other planets as well. What are clouds? They are "the visible aggregate of minute particles of water and/or ice". They form when water vapor condenses. 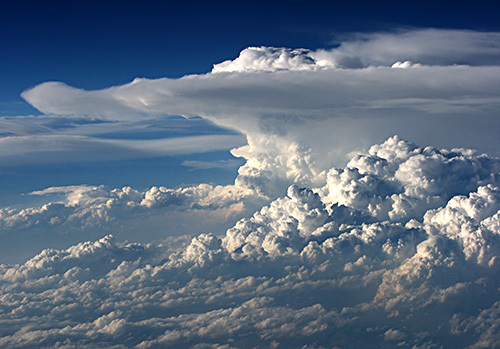 Become "Cloudwise" by learning about clouds and how they form.